While working on my doctorate, I lived for a time in an apartment just down the street from a small wastewater treatment facility. I never noticed a bad smell, but if I stayed up too late I'd end up having to fall asleep to the very low pitched rumble of gallons upon gallons of poop water being pumped into and out of large tanks. I tried not to think too hard about this, which tends to be difficult when you're, y'know, trying to fall asleep. Wastewater treatment facilities, or sewage treatment plants if you're old school and talking specifically about municipal (read: lots of poop) as opposed to industrial wastewater, are interesting places. 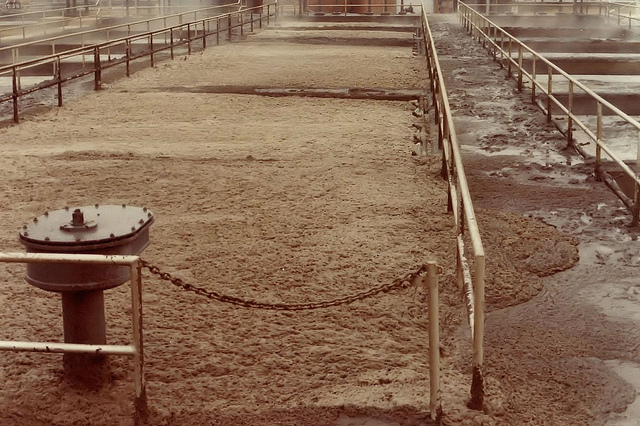 Physical, chemical, and biological processes are put to work to clean up dirty water by removing particulate matter and harmful (or at least unpleasant) microbes and chemical compounds. 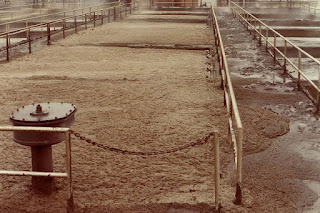 As it works its way around a facility, wastewater typically experiences the thrills of sedimentation (essentially, grease floats and solids sink), filtration, chemical oxidation (breaking down organic compounds and killing microbes) by adding chlorine/ozone/bleach, and microbial growth (which removes organic compounds and inorganic nutrients). One of the more interesting microscopic inhabitants of your typical sewage treatment plant is a bacterium called "Microthrix parvicella". The quotation marks are necessary because its status as a proper taxonomic name remains in flux. Nevertheless, this name is commonly used by those in the wastewater treatment industry. Getting the name thing sorted out requires the collection of sufficient information about the biochemical pathways utilized by the bacterium, which is difficult since it doesn't like living alone under controlled conditions in a laboratory (it grows very slowly and doesn't appear healthy). In sewage, "M. parvicella" usually appears as long, thin, and unbranched cell-filled threads with a propensity to coil up into tangles (it is often likened to cooked spaghetti), making it easy to spot under a microscope. 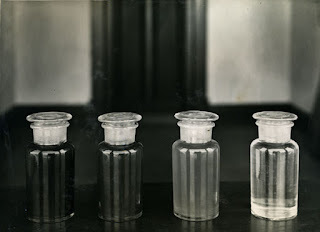 When grown on its own in flasks on a lab bench, the threads often contain swollen and dying cells, indicating the bacterium is under considerable stress. "M. parvicella" belongs to the phylum Actinobacteria, which includes a bunch of other rad thread-forming bacteria (e.g. Streptomyces). Remarkably, as far as we know, it's only found in wastewater treatment facilities. Where the heck did it live before these were invented? Folks in the wastewater treatment industry are interested in "M. parvicella" because of its contributions to bulking and foaming at treatment facilities all over the world. These physical changes to wastewater make it more difficult to separate out its solid and liquid components, which happens to be a key part of the whole treatment thing. Thus, facility operators are very interested in ways to control the growth of the bacterium. Unfortunately for them, "M. parvicella" is a resilient bit of microbial spaghetti. It's a chemoorganotroph, meaning it can extract energy and carbon building blocks from organic compounds (which just happen to be plentiful in sewage). Further, it's able to utilize both simple and complex forms of such compounds, helping it to compete with other microbes. Unlike many of its sewage neighbours, "M. parvicella" is okay with growing at low temperatures and under low oxygen concentrations. Due to its cold tolerance, it tends to be a major member of wintertime microbial communities inhabiting treatment facilities in temperate parts of the world. It's able to survive for months without access to oxygen (such conditions are known to develop in municipal treatment facilities), bouncing back quickly once a supply of the gas (in dissolved form) is restored. Aiding its survival, the bacterium is able to store lipids inside its cells as food for a rainy day.